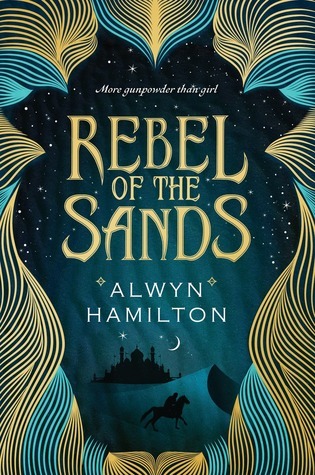 Today I am reviewing Rebel of the Sands by Alwyn Hamilton. I read this book while travelling into town on the train. I was incredibly exhausted at the time and it was good to have a book that was easy to get into and didn’t take much effort to read. Rebel of the Sands follows Amani who is described as a ‘gun slinger’ although her sharp shooting only seems to come in useful in a couple of occasions. Amani is in a little town in the middle of no where and is about to be married off, understandably she wants to get out. Amani meets Jin, a mysterious foreigner and sees the possibility for escape. Unfortunately she isn’t really given a choice considering that Jin is wanted by the army and her relations with him make her wanted too. Together the pair of them ride trains, traverse the desert and nearly wind up dead several times while on the run from the army that seems to have more tricks up their sleeves than expected. This book was so wonderful. It was a familiar fantasy that is up to par with all the other ones I love except it is amazingly different in the politics and setting. This world isn’t stuck thousands of years in the past with no technology, guns are a thing and times are changing which is something I really enjoy seeing in novels. The world felt real and although there were magical elements it didn’t overpower my belief of the events that were taking place. The main character Amani was talented and not a whiner which made her someone I liked. She was realistic and although she had her flaws these were things I could see myself doing in the situation which made them all the more painful for me to read because I didn’t have to do much to understand where she was coming from. From what I saw of Jin I liked him but most of how we as the reader got to see him was through Amani’s thoughts which left me unsure of whether I actually liked him as a character. The characters she meets at the end were difficult to keep track of, there were just so many introduced at once and not enough was done to differentiate them in my mind. I gave up trying to tell them apart. Another thing that surprised me was that some characters didn’t play as big of a role in the book as I was expecting but maybe it will be more important later in the series? This series has great potential and I am excited for the next book in the series. This book was so short compared to others I read which is nice. Amani’s constant fawning over Jin got annoying – show my why I should love him don’t tell me why she loves him. I can’t explain how nice it was to see a desert setting with mythical creatures that fitted well. The world building was really good. The villains of the story were introduced early on and almost all of the characters in the book had multiple reasons for being there which made it so much more interesting. I’m glad you liked this one!! I love it too!! And omg I agree that it’s really refreshing how it’s just short and fun and exciting?! (The next one is like 500 pages though, haha, so watch out.) And I agree the ending did introduce a lot of characters a bit too fast…but I still loved the overall story so much. <3 Amani's sass was EPIC.